Al, in 1957 the top of the line was a Fairlane 500 and our neighbors had a two tone convertible in white and that semi pinkish beige!! It was BEAUTIFUL. Then my folks got a 57 Ford Station wagon in blue and white, which was nice but they toned down the fins on the lower end fords and the wagons. The fins didn't have quite the rake or the point as the Fairlane 500!! I'm with Sandy, there are applications for this color (I think Chrysler combined it with a darker green or something?) and as long as it's not on my walls, I'm good. We still haven't painted the new townhouse. So we have bold red, peach, green, and a kind of magenta lilac, not to mention blue and yellow. I'm not sure what drugs these people were on when they decorated but..... I kinda wanna try some. But not when i'm picking out paint, though..... JEEZE!!! Use the good china. Life itself is the special occasion. Tom, looking at those colors all day, maybe you don't need drugs! We used to call that "Linda Blair green," LOL. "Living Coral" I used to watch that show. The Wayan brothers and Jim Carrey, right ? 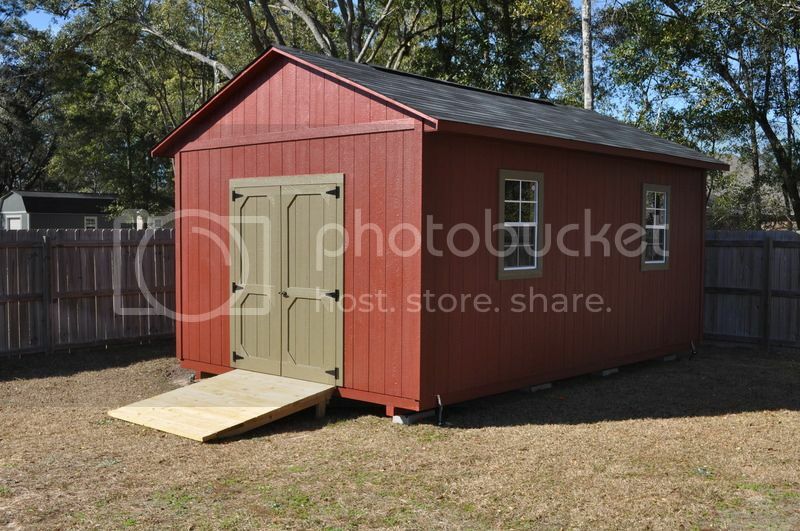 Got a new shed in the yard, the hardest part was finding the right colors. The HOA said I had to try and match the house, but my brick is multicolored, and this was what I went with. I wasn't having a brown shed, that's fer sure. Of course I went through 6 samples before I picked these colors. Sherwin Williams rocks, but my idea of hell is a fan of 500 paint colors and trying to pick the right color. Sherwin Williams Rustic Red and Roycroft Brass. I wasn't aware of the story behind Roycroft, but they have a line of craftsman colors that I liked, and Roycroft has some interesting history. Not a fan of the living coral. Bleh. Last edited by FNG; 02-02-2019 at 06:31 PM. Wait, isn't that a shampoo? It's beats a real poo. That shed looks really nice, Effin. Truth be known, I'm not a big fan of the pink coral inlay on the DV-74 either. Is that not barn red? Good thing the Salem witch trials are over. Sounds like something from the dark side.